Studies have shown the harmful effects of bullying. As a result, schools, parents, and children are attempting to deal with the new reality of bullying. Many schools have adopted a zero-tolerance policy against bullying, meaning the child is out of school on suspension after even one offense. That being said, a bully is not always a child on a school playground. A bully can be an intimidating boss or colleague, a controlling romantic partner, an unruly neighbor, a high-pressure sales representative, or a shaming social acquaintance. Bullying does not always end after childhood and often continues into adulthood. Oppressive personalities are typically fostered by personal displeasure, and a person who is usually unhappy will prospectively carry tyrant-like behavior with them throughout their adult years. This behavior is also likely to be harbored by those struggling with anger management problems expressing themselves in unhealthy ways. 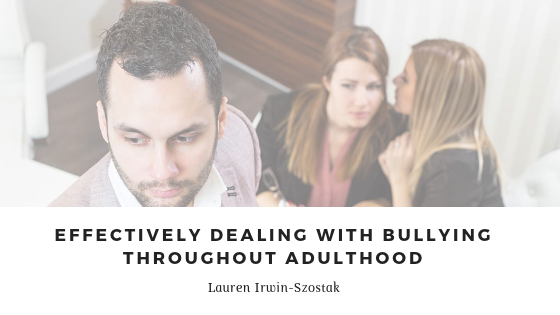 It is clear that these people exist in our lives, but what are the different types of bullying that one can face as an adult, and how can they be effectively dealt with? Compared to physical bullying, intellectual bullying has been largely underestimated by the media, and it is especially prominent in the workplace. Arrogance and egotism play a large role in the existence of “intellectual bullies”. Variations of individual intelligences should be celebrated, but weighing one’s own intelligence over others’ becomes problematic. The power-hungry conduct that this emulates enforces the discriminatory beliefs that many bullies thrive on. This type of bullying in adulthood is notable due to the fact that childhood physical bullies may be more likely to soften their ways in adulthood, but intellectual bullies may become increasingly threatening over time. If someone is bullying you in this way, he or she is probably affecting a coworker of yours as well. Reporting derogatory behavior that targets personal intelligence is extremely important. Companies are taking bullying just as seriously as schools are, and the bullying of employees should be handled appropriately. Having an employee or coworker who is predisposed to expressing negativity throughout the workplace affects the feelings of competence within other employees, thus affecting workflow and production. One of the more common forms of adulthood bullying occurs online. The internet has facilitated bullying by providing the bully with a screen to hide behind. Many types of tangible, verbal, and passive-aggressive behavior can be conveyed online via social media, texting, video, email, online discussion, and other digital formats. One of the most prominent forms of bullying in adulthood is ageism. Ageism is essentially a denial of basic human rights. Instead of regarding older members of our workforce as wise, ageists view them as people who are “slow to learn” or “out of touch” with the current technological workplace. If you are a victim of ageist bullying, there are several ways to combat it. First, you should engage with your coworkers and the world around you. The more physically and mentally active you are, the more “in touch” you will be with younger coworkers. No form of bullying is acceptable, but you can reduce ageism-type bullying by engaging with its practitioners. Rather than demonizing the person bullying you, use their bullying as an opportunity to educate them. Unfortunately, bullying is a part of life, from childhood through adulthood, and most consequences seem to be sub-par at best. Some people experience bullying more than others, while some regrettably engage in the negative behavior themselves. While we cannot eradicate bullying altogether, we can take steps to combat it. Instead of allowing yourself to be the victim, take matters into your own hands through affirmative steps designed for the education of oppressors. How do we teach kids not to bully, when the whole world is bullying?